OpenTable has been a runaway success story in the online restaurant reservations marketplace, consistently killing the competition stone-dead. The power of the service is best observed in America — particularly in the Bay Area, where most of the restaurants I’ve been into actually have an OpenTable reservation system sat there when you walk in the door. I love the fact that I could book a table within about three clicks. And it was properly booked. No arsing around with fax machines at their end. No missed bookings. My booking was *IN* the restaurant’s system and when I arrived, sure enough, the chap at the desk will see my details right there. I love it. And millions have been waiting for the OpenTable app. You can get OpenTable on BlackBerry, Palm and now Android. As a result, OpenTable has now processed 2 million bookings via their mobile application platform! That’s not downloads. That’s bookings! Just for fun, assume that each meal booked results in a $70 spend at the restaurant including wine and tip. 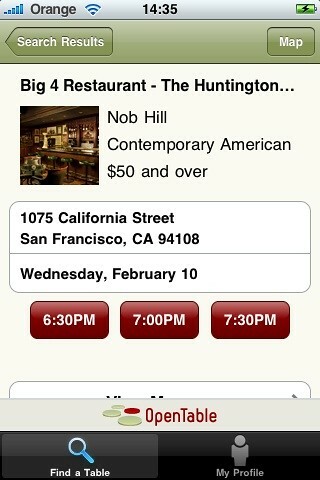 That’s some OpenTable mobile app economy! That’s $140m worth of restaurant spend… being booked through just the *mobile app*. This isn’t counting the OpenTable website. Another tap and I can have the 7:00pm slot booked. Done. So fast, so useful.